Und jetzt ich muß schlafe. My god if I butchered that someone please let me know. That’s what I want to be. My dream profession. To get paid a million gazillion dollars to play lots of different sports at a less-than-professional level. ‘Cause we all know I have neither the athleticism nor the talent to play anything professionally. But I do like to play. A little bit of everything. So many little bits of everything that I could very easily become very professional at it. The little bittiness, not the actual playing. Erm, am I making sense? Am I repeating myself? I do indeed think I am, although I’m not quite sure how. Forgive me, it’s late. I know that 1:30 isn’t late for most of you out there, but I’m dead tired. I’ve been up since 6 AM! Time to go curl up into my sleepball. 1. I think I’m hungry. 3. I’m pretty sure I’m hungry. 5. I know I’m hungry. 7. Everyone else around me knows I’m hungry. 10. My head feels light. I don’t know what happens after number 12. I’ve never made it past 12 because the only time I get that hungry is when I’m doing something that involves other people, and by that time they’re so afraid of me and my hunger-induced crankiness that either we go eat or they start feeding me whatever they can find. I just noticed that my word of the morning wasn’t a word. But it’s a phrase that acts like a word. Check this out. Some dude in New Jersey punishes his wife when she’s bad by biting her. That’s weeeeeird. Isn’t he acting a little monkey-like? Plus, he somehow managed to fracture 10 of her vertebrae in the process. How do you even bite down on a vertebra? Maybe I’m not interpreting the article properly? I’m confused. Well, now. I think I’m annoyed. No, I know I’m annoyed. I just don’t know whether it’s with myself or my boss. He’s probably annoyed with me. Courtesy of the South Park kids. – Dude! I lost my hackey sack in the blime! – Ow! I just got hit in the blime! – Wow! That’s so blimey! – Oh yeah? Well blime you! 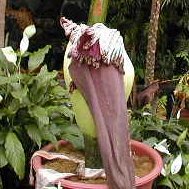 At 1:30 p.m. on Monday, June 11, the top half of the titan arum’s spire-like spadix fell over, exhausted by its titanic reproductive effort. Exhausted! I’d say! That thing went for 2 weeks!